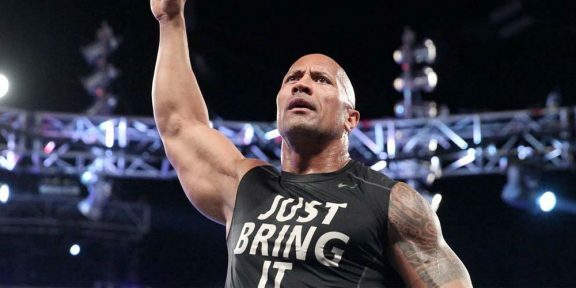 Comments Off on Is WWE teasing a return from The Rock? The tease could obviously be regarding his new show The Titan Games on NBC but wrestling fans are already picturing The Rock in the ring at WrestleMania following that post. One arena which The Rock likes to come back to is the Honda Center in Anaheim, California, and WWE has a post-Elimination Chamber Raw set in that arena on February 26 which could be a good location to get things moving! The plan as of now is to get Triple H and Stephanie McMahon in the ring as a tag team to take on Ronda Rousey and The Rock at WrestleMania 34. WWE has been trying to secure the services of the People’s Champion but things could be tricky due to insurances. The last time The Rock wrestled a proper match at WrestleMania in 2013, he ended up getting injured, delaying the filming of Hercules which cost the production house a couple of million of dollars. Johnson has a few movies to film this year apart from his HBO show Ballers and the new NBC show. The Rock was completely absent from WrestleMania last year.